After I returned to Ulaanbaatar from the Gobi Desert I spent most of the days hagning out with new friends while the nights were spent conversing at the local watering holes. I had the chance to attend a house party, see traditional Mongolian Theater, visit the somewhat laughable Mongolian Museum of Natural History, and, most impressively, order bottle service at the bar every night ($20 for a very drinkable bottle of Genghis Khan vodka!). The city was growing on me and I was having a great time and meeting lots of cool people, but my journey was steadily coming to an end. The evening of the race we all crawled back to camp to nurse our wounds with food and beer. The more experienced runners among us weren’t doing so bad, but the rest of us were left with extremely sore muscles and blisters a plenty. Even though I was running in hiking shoes I somehow managed to escape getting any blisters, so I was thankful for that. The next morning we got our stuff together, had breakfast, and jumped into the minivan once more for the long ride back to Ulaanbaatar. She wasn’t hard to find, as she was the only white lady walking around with a dog. 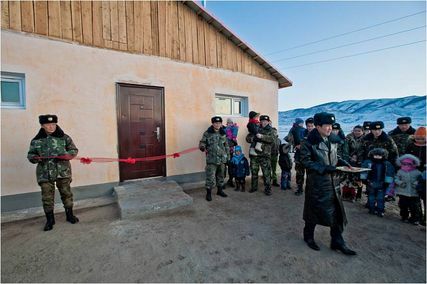 Brigitte is the founder and member of the Rotary Club of BayanZurkh, which my Rotary club (West Bloomfield, Michigan) had partnered with in order to assist in building a kindergarten in rural Mongolia. Munich-born, Brigitte attained U.S. citizenship decades ago and then went to Hong Kong to live with her husband before he passed away. After that she took a huge step in moving to Ulaanbaatar, Mongolia by herself and opening up her own business. Having lived in Ulaanbaatar for over twelve years she is now the owner of Sacher’s Cafe, a German Cafe & Bakery in the middle of town, and is one of the most prominent socialites in the city with a diverse set of friends ranging from the president of the country to ambassadors from all over the world to the high lama of Mongolia. When we first met in person at the 100th Annual Rotary International Conference in Birmingham, England some months prior she had been gracious enough the offer up use of her residence to me during my stay, and I of course accepted. Having nothing better to do than sleep for the time being I decided to explore what would be my surroundings for the next three days and nights. I walked the narrow hall and found car after car looking exactly like the one I was in. I went on for about six cars or so before deciding to turn back–there obviously wasn’t much to see here. A few cars before I hit my own I heard some English voices and peeked in a berth while passing to see four white faces. “Ahh–nice to hear some English!” I remarked, sticking my head inside for a second. “It was actually Dutch, but no biggie” replied one of the guys in the room. They invited me inside and we introduced ourselves before breaking out a bottle of vodka. Turns out they were from the Netherlands and Belgium and had met up in Moscow when boarding the train. We had a nice chat before fatigue got the better of me and I retired to my cabin.